Open worlds are now more or less obligatory in videogames, and with Ubisoft's franchises like Assassin's Creed and Far Cry already under its belt, the French publisher has led the charge to create ever huger and more elaborate ones. But its first foray into the territory of open-world driving games, 2014's The Crew, fell flat. Saddled with a cliché-ridden, criminal-turns-FBI-informant plot and an awkward interface, it proved disappointingly lacklustre. Some deep rethinking later, the resulting The Crew 2 is several orders of magnitude better than its predecessor. Indeed, it posts something of a benchmark which rival franchises (like the ever-excellent Forza Horizon) will have to work hard to hurdle. With The Crew 2, developer Ivory Tower has taken a radical approach to solving the first game's most glaring problem: it simply did away with anything recognisable as a conventional storyline. The game does have an overarching premise, though: you're an up-and-coming street racer who is introduced to the four fictional families that run grassroots racing events across the USA. As you compete in their events, your social media following (and virtual bank balance) grows, and you eventually work your way up to superstar status. This time around, that's not just achieved by racing cars. Ubisoft also addressed The Crew's general lack of a personality of its own by giving The Crew 2 a USP among open-world driving games: it also includes boats and planes. Which, rather brilliantly, you can seamlessly toggle between with a mere click of the right joystick. The first event in the game, a round of what it calls the Live Xtrem series, illustrates that by morphing your car into a boat and then a plane at specific points. One of the game's best aspects is the sheer diversity of the events it contains. Each racing family has a specific style they adhere to across races that involve various types of vehicles, namely Off-road, Street Racing, Pro Racing and Freestyle. At first, the Freestyle races mostly involve performing aerobatics in planes, for example, and the bulk of the Pro Racing events are powerboat races. A key mechanic is your fame level, of which there are five: Rookie, Popular, Famous, Star and Icon. Every time you level-up, you unlock new event types, so the more you play the game, the more there is to play. There are vast amounts of events to choose between: along with the street races, powerboat races and aerobatics events, you find off-beat things like drag races and drifting events, timed monster truck runs in huge skate-park-like playgrounds, motocross events, rally raids, jet-boat races and air races. Hypercar races take place over ludicrously long courses that require you to keep an eye on the mini-map – they can take over 30 minutes to complete. Most of the races, in whatever vehicle or family classification, are checkpointed (even the Touring Car races which take place on proper tracks). The Crew 2 isn't afraid to throw curve-balls, such as a race in which a competitor crashes, so you then have to get him to the nearest hospital within a time-limit. There are also special events like a street race sponsored by Papa John's pizza, and a long country-road romp with everyone on Harley Davidson bikes (which brought to mind Road Rash). Whenever you satisfy the objective in an event, you're rewarded with loot boxes containing upgraded components for whatever vehicle you're driving, so you can improve cars in a similar manner to Gran Turismo games of yore. Happily, Ubisoft has resisted the temptation to sell loot boxes to players in exchange for real cash. While the events are satisfyingly diverse and off-beat – but still manage to provide a few treats for those who prefer their driving games more sim-like – The Crew 2 has more to it. Its map is mind-blowingly huge, encompassing the whole of the United States mainland from the Bay of Mexico up to Seattle. Of course, it isn't geographically accurate – it has been squashed up between cities, and doesn't include many of the USA's small towns – but it's packed with spectacular locations like the Hoover Dam and Mount Rushmore, and constitutes a fabulous playground in which to cruise around. There's plenty to do on a random drive too. You add followers for jumps, drifts, near misses and so on, while there are speed cameras to test yourself against, slalom courses to find and random photographic assignments that crop up unexpectedly. Indeed, The Crew 2 contains a whole photo-taking engine, along with an editor that lets you turn your driving exploits into short films. Car-wise, The Crew 2 is hard to fault. It's studded with exotic machinery: when you unlock the Alpha Grand Prix series (essentially a checkpointed take on Formula One), you're given the opportunity to buy a Red Bull F1 car surprisingly cheaply. You can design stickers and logos for all your vehicles. While the handling of all the vehicles is very much arcade-style, it still feels pretty spot-on. The more you pilot the planes and powerboats, the more subtleties you notice, such as the effect of waves on the latter. 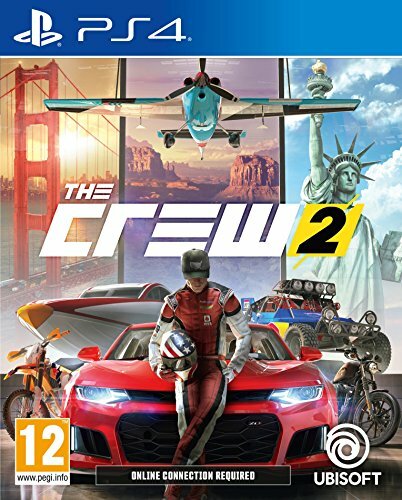 There's an online side to The Crew 2, but of course, which isn't pushed down your throat, but which should appeal to those who are sufficiently organised to play games with their mates. Up to four players can enter events co-operatively as a crew (hence the name), and up to eight can randomly cruise around together, which boosts the amount of followers you glean when pulling off flashy manoeuvres. Overall, The Crew 2 is way better than the first game. It's super-slick and has a great knack of throwing you into spectacular scenarios. The boats and planes are pretty easy to get to grips with, so it's definitely one of the more forgiving driving games, especially in its earlier stages. As with all 'playground'-style games, there is a question-mark about what will happen when you reach its endgame, although Ubisoft has an impressive-looking roadmap of things it will add in the future, and when you reach the final Icon status, that has 999 levels of levelling-up to perform. The next iteration of Forza Horizon will have to offer something spectacular if it's going to outshine The Crew 2.